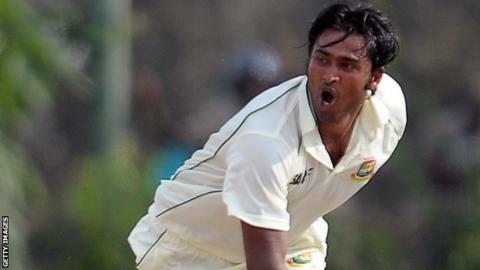 Bangladesh cricketer Shahadat Hossain has turned himself in to face charges of torturing an 11-year-old housemaid. The fast bowler, 29, had been missing since 6 September when allegations were first made about him and his wife. The court has rejected the bail petition submitted by Hossain and has sent him to jail, a day after his wife was arrested by police. The country's cricket board has suspended him from playing cricket. Both he and his wife deny the charges. Hossain's lawyer, Kazi Nazibullah Hiru, told the AFP news agency: "We appealed to the court that Shahadat should be released on bail for the greater interest of the country. "We pleaded that he is not guilty as he was not present on the day the girl was allegedly beaten." Why were police looking for Hossain? Initially, Hossain went to the police on Sunday, 6 September, saying his maid had gone missing. However, when the girl was taken to police, after she was found alone later that day, she told them she had suffered torture and abuse from Hossain and his wife. Doctors say the girl had extensive injuries indicating abuse, including a broken leg and a black eye. When the police went to the couple's house to question them, neither were there. Hossain is a medium-fast bowler who is arguably one of Bangladesh's most famous player. He has played for the Tigers since 2005. He has taken 70 wickets in 36 Tests and 47 wickets in 79 one-day internationals, with best figures of 6-27. Domestically, he plays for Dhaka Division. Hossain last played for Bangladesh in a Test match against Pakistan in May, when he twisted his right knee and was ruled out action for six months. He was the first Bangladesh player to have his name added to the Lord's honours board when he took 5-98 against England in May 2010.